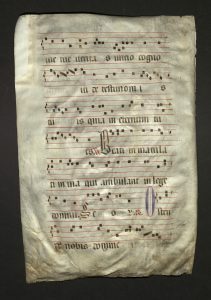 This page made of vellum (prepared calfskin, sheepskin or goatskin) was produced in the late Middle Ages, probably between the 13th and 15th centuries in Italy or Spain. 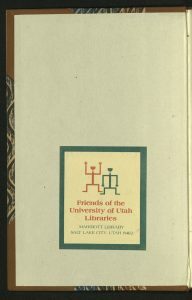 It was purchased in New York City in 1974 for $25 by Professor James Svendsen, who donated it to the University of Utah Marriott Library in 2018. 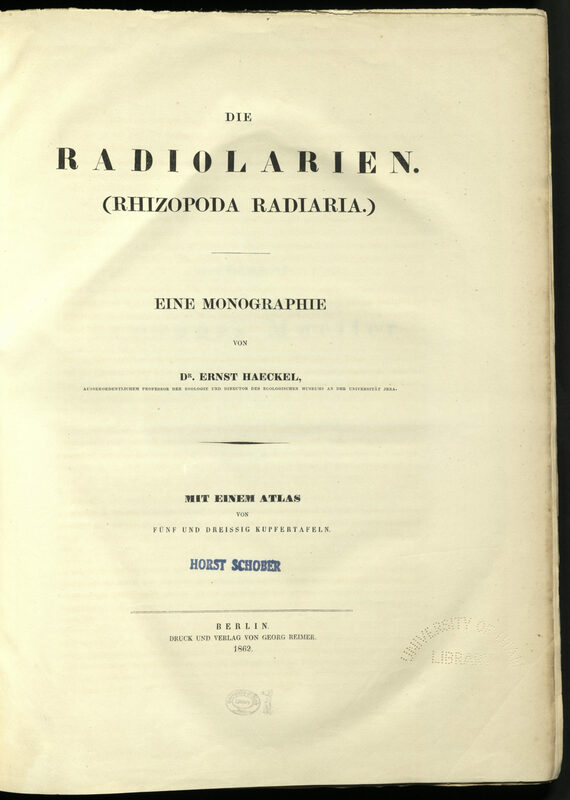 Dr. Svendsen provided the transcription, translation and commentary. “The texts from the Old Testament are written in the Latin of the 14th c. Vulgate attributed to St. Jerome. 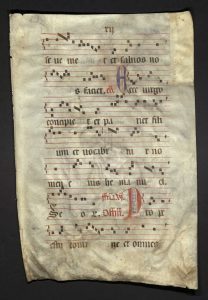 They utilize the musical notation of Gregorian Chant with two clefs (fa/do), rests, custos, neumes etc. 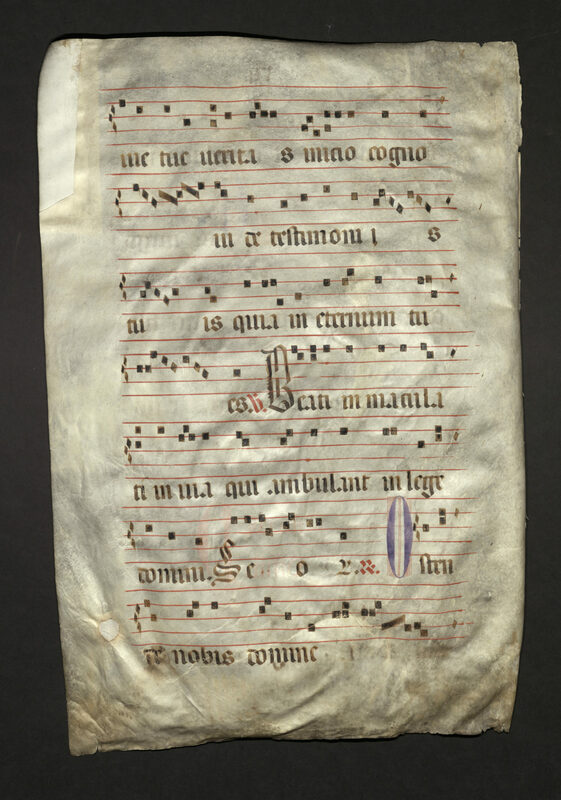 The most frequent neumes (names of notes sung on a single syllable) are the punctum, melisma, qualism, climacus etc. The five-line staff & custos (the Latin word for “guard” and a small note at the end of a line indicating the next note) are products of 13th century Italy, replacing the earlier four-line staff, and provide a terminus post quem for the manuscript. There are four illuminated letters (E, P, B, O) at the beginning of initial words. 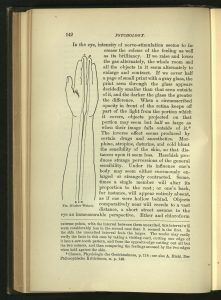 The abbreviations CO. (for collectum) and OFFM. 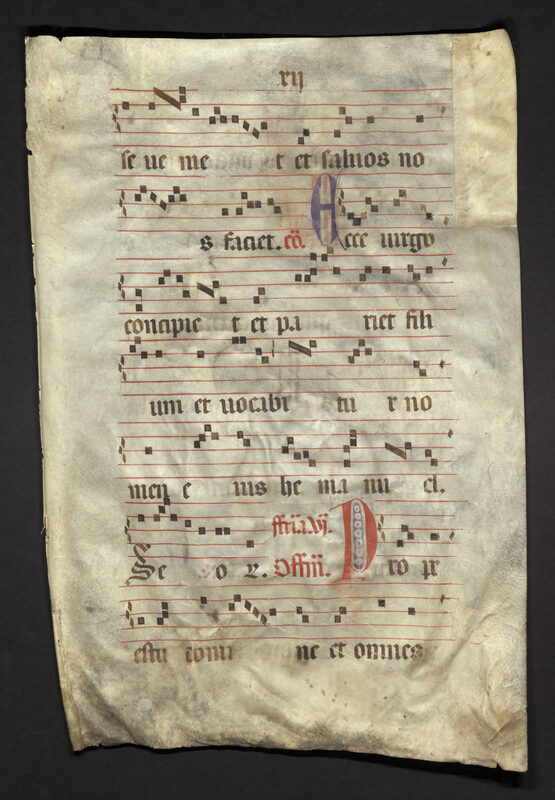 (for offertorium) indicate when the hymns would be sung during the mass: the collect before the readings and the offertory when gifts are brought to the altar. We are grateful to Dr. Svenson for this wonderful gift. It is a matter of just displeasure to God, and sad grief of heart to the church, when civil states look at the estate of the church, as of little, or no concernment to themselves. English Puritan preacher John Cotton fled to Boston, Massachusetts in 1633 to evade persecution by Anglican Church authorities. In the colony he became an advocate of decentralizing the church and allowing individual congregations to govern themselves. Cotton defended a rule that allowed only church members in good standing to vote and hold office in the colonial government and condemned the idea of democracy in which policy decisions were made in popular assemblies. When Cotton arrived in Boston, Roger Williams was already in trouble with religious and political authorities. In 1635 he was convicted of heresy and spreading “new and dangerous ideas” and banished. Williams, supporter of religious freedom, separation of church and state; abolitionist; and ally to the American Indian, thought that the Puritans had not gone far enough in separating themselves from the beliefs and practices of the Church of England. 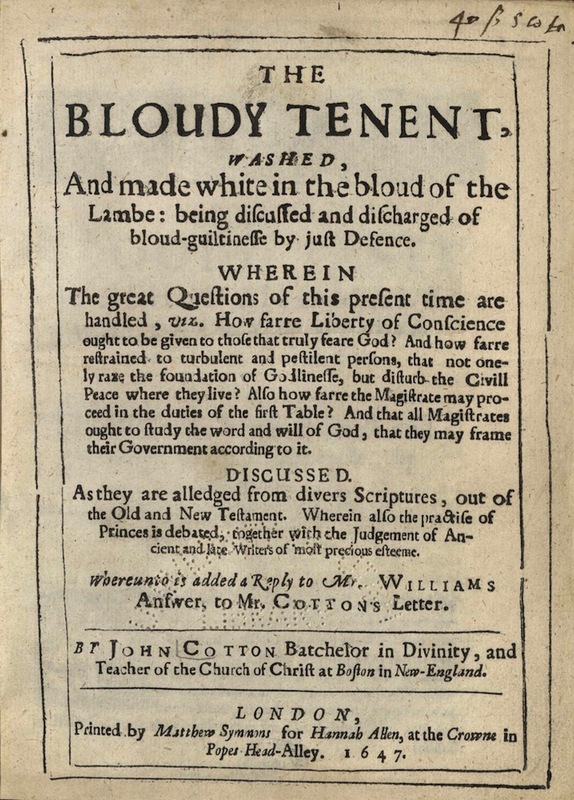 Williams identified John Cotton with the Massachusetts Puritans and his tormentors, and his important tract on religious liberty, The Bloudy Tenent, was framed as a critique of Cotton. Cotton responded with his own Bloudy Tenent, a point-by-point rebuttal of Williams and a defense of the institution of the church. Cotton argued that the allowance of religious tolerance would give church members the sense that they could stray from a narrow path created by God. 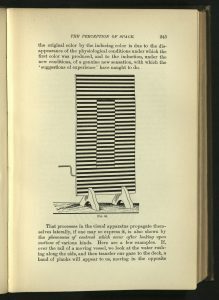 While visiting Special Collections from Plano, Texas in 2009, Craig Dalley perused The Feminine Touch, a Rare Books exhibition then installed in the Special Collections Gallery. 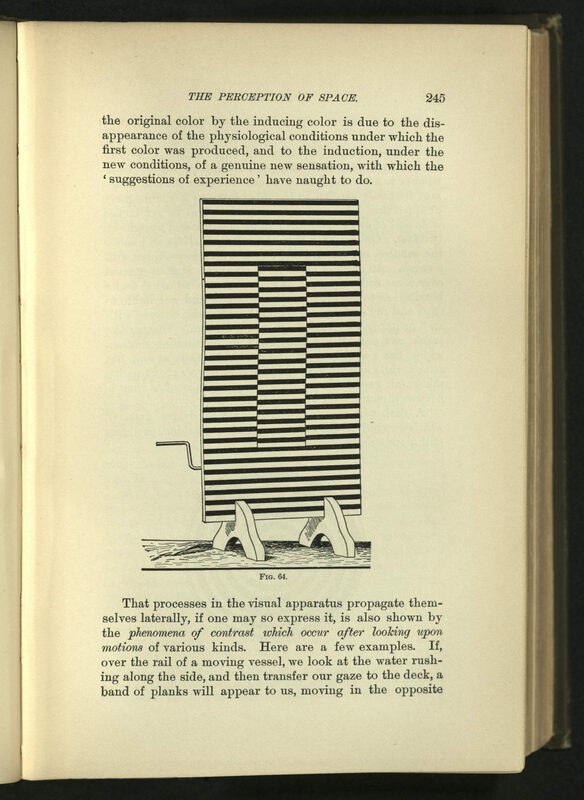 In the exhibition was The Bloudy Tenent, a book he recognized as being printed by one of his distant ancestors. 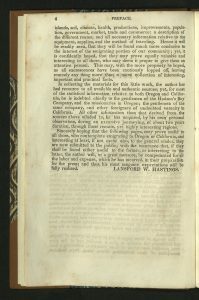 He published an article in The New England Historical and Genealogical Register (Volume 170, Winter 2016), “Religious and Political Radicalism in London: The Family of Thomas Howse, with Massachusetts Connections, 1642-1665,” which includes a discussion of Hannah Howse Allen Chapman (ca. 1614-ca. 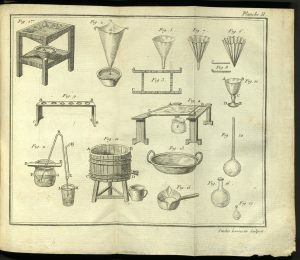 1665), a printer and the publisher of the above book. Last week, Mr. Dalley visited us again and graciously gave us a copy of this issue for our collection. Hannah Howse’s first husband, Benjamin Allen (ca. 1596 – ca. 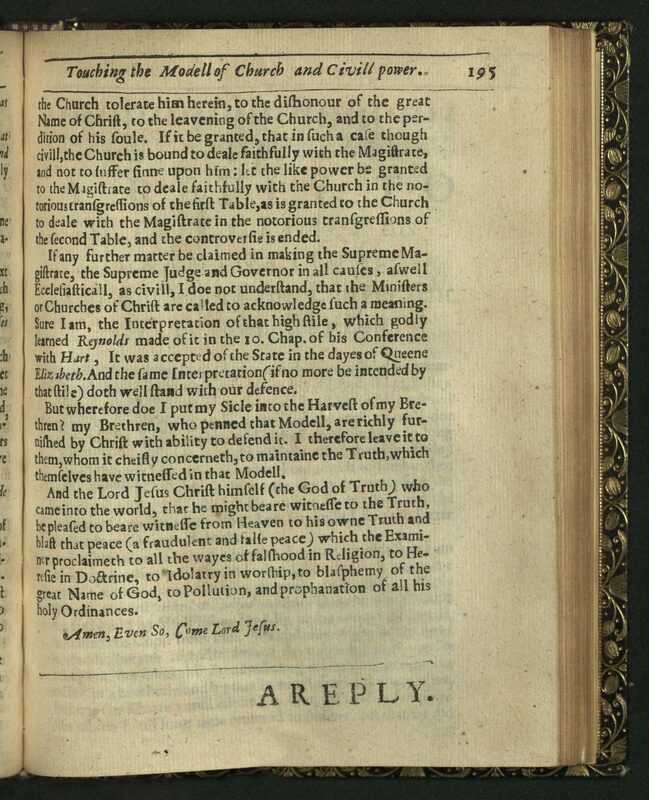 1646), had published at least two pamphlets along Puritan separatist lines. Hannah continued printing and publishing separatist material with her second husband, Livewell Chapman (ca. 1625 – ca. 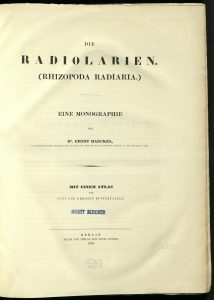 1665). Mr. Dalley is an engineer who started his career working on the Hubble Space Telescope. He has researched John Lothrop, his London congregation, and allied families for about twenty years and is planning a book to document his Lothrop research. Thank you, Mr. Dalley, for bringing life to this 371 year-old book. 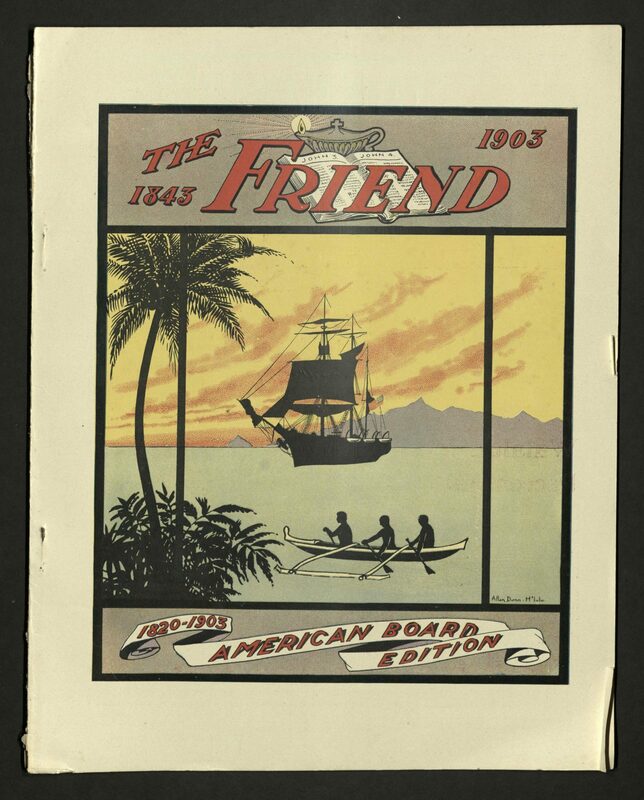 Rare Books is the happy recipient of a gift of a set of issues of The Friend, from our generous friend, Lou Weinstein. The donated set begins with a July 6, 1870 issue and ends with the March 1946 issue. 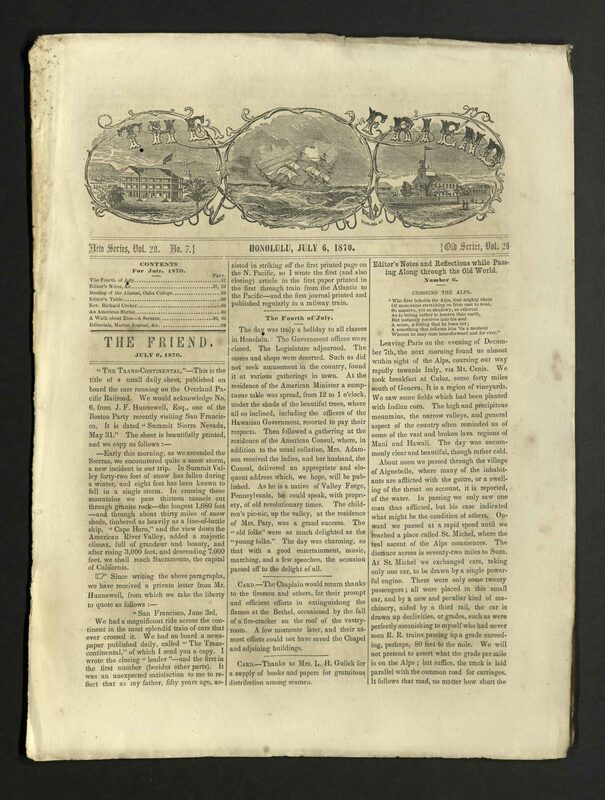 The first issue of The Friend was published in January 1842, originally under the name Temperance Advocate. 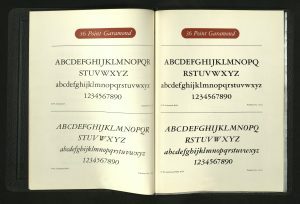 After a number of variant name changes, The Friend became the official name beginning January 1, 1845. 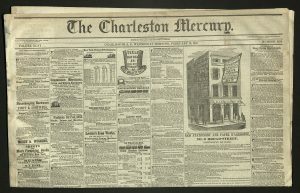 The newspaper began as a monthly periodical for seamen and included news from American and English newspapers. 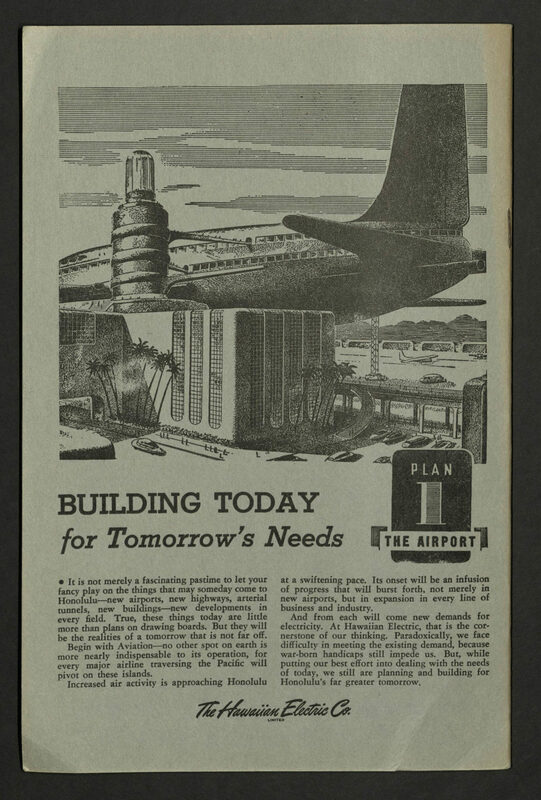 Gradually, the monthly expanded to feature announcements, advertisements, reprints of sermons, poetry, local news, editorials, arrivals and departures, marriages, and obituaries. 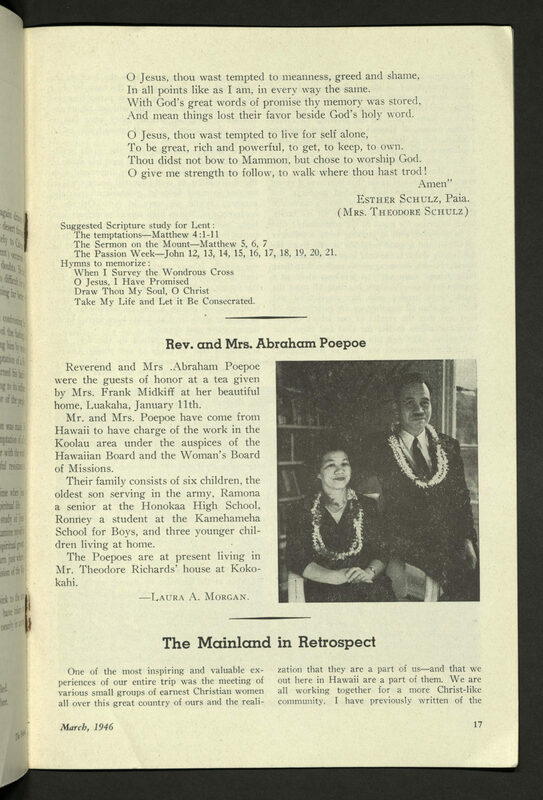 The paper was published by the Reverence Samuel Chenery Damon, who was sent by the American Seamen’s Friend Society to be chaplain in Honolulu. He was the pastor of the Bethel Union Church, Seamen’s Chapel for 42 years and editor of The Friend from 1843 to 1885. 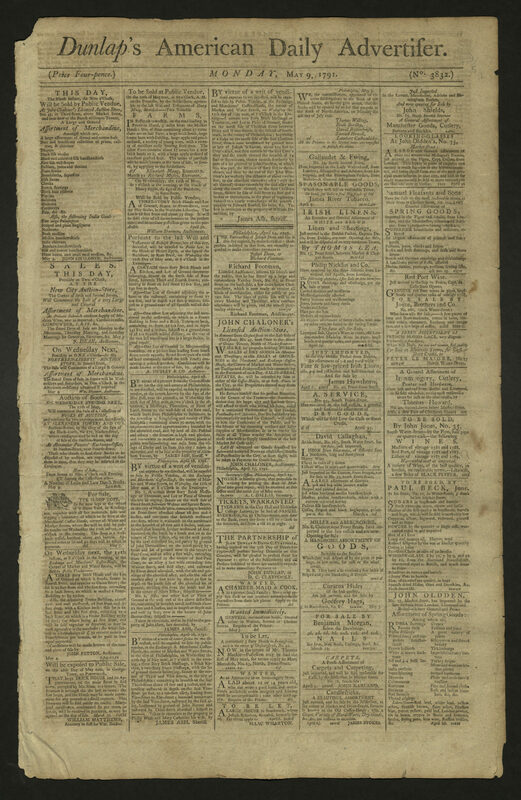 Under Reverend Damon, nearly one million copies of the newspaper were distributed. 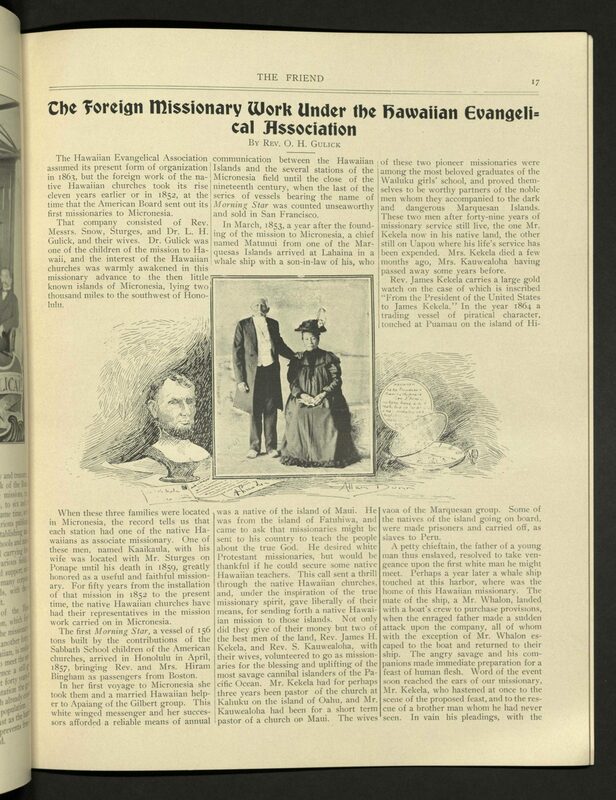 The newspaper came under the editorship of the Board of Hawaiian Evangelical Association in April, 1902 where it remained until June 1954. Since then, it has continued under various names under the Hawaii Conference-United Church of Christ. 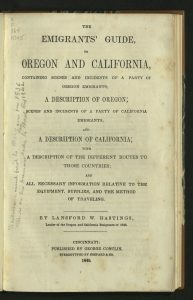 To get from Illinois to California, the Donner-Reed party had relied, in part, on a bestselling book called The Emigrant’s Guide to Oregon and California. 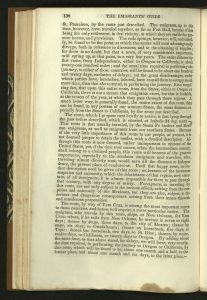 The author was Lansford Warren Hastings, a young real-estate entrepreneur from Ohio who had financial and political interests in California. Hastings, at age twenty-three, had made a trip west in 1842. 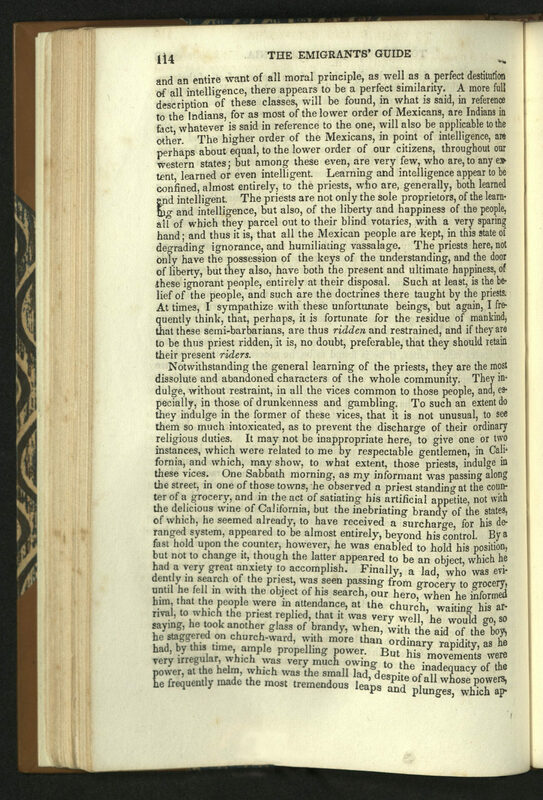 In his “guide” he depicted Indians as lazy and Mexicans as dishonest, blaming much of the latter on the priests of the Roman Catholic Church. Hastings’ “little work,” as he called it, was inspirational to those wishing to escape the crowded conditions and poor economy of the east and Midwest. Hastings’ book promoted the land and climate of California as ideal companions for hardworking “Americans.” His book was read by one of the drivers of the Donner family wagons. 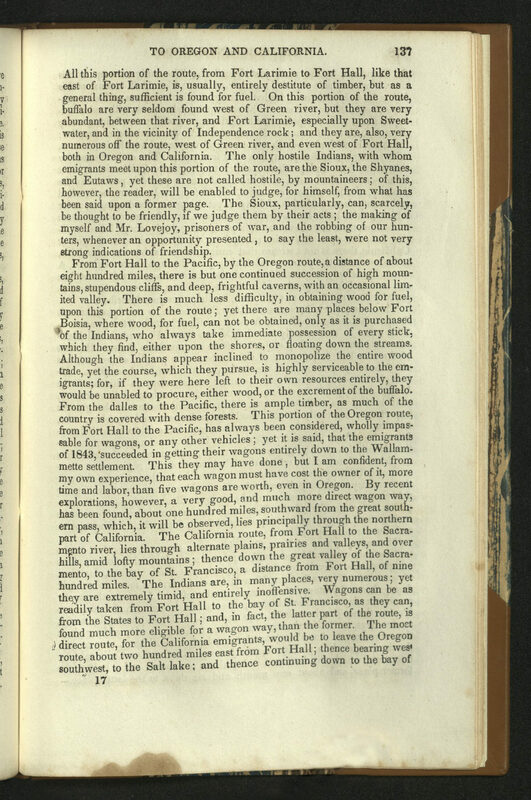 A copy of the book, owned by Jacob Donner, much-handled, was found in the saddlebag of one of the travelers. Hastings’ guidebook had bad information and good. The Reed family brought with them an invalid grandmother, a piano and an iron cookstove. The Donner-Reed Party, stopping at Fort Bernard, were warned not to take the route. Still, they had been delayed for one reason or another almost from the start and needed to make up time. The shortcut would enable them to do so. A meeting with an emissary of Hastings, on his way back to Ohio, convinced the Donner-Reed Party even more of this need. In a letter, Hastings warned of the war between the United States and Mexico and advised travelers to take his shortcut of about two hundred miles, promising to meet the emigrants at Fort Bridger and to guide them over the deserts and mountains of his new route, crossing what would become the states of Utah and Nevada. It was a convincing proposal. Hastings never met them. The party found another guide to take them as far as the salt plain west of the Great Salt Lake. Again, others warned against taking this route. Thank you, Friends of the Library, for your many gifts to Rare Books over the years, including this historic guide. 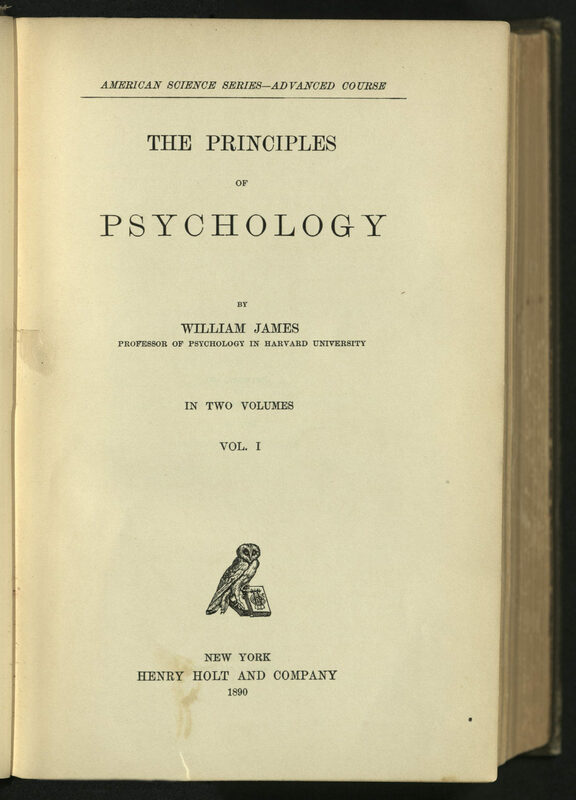 Rare Books is pleased to announce the anonymous donation of this first edition of William James’ The Principles of Psychology, a work emphasizing his experimental method and treatment of psychology as a natural science. 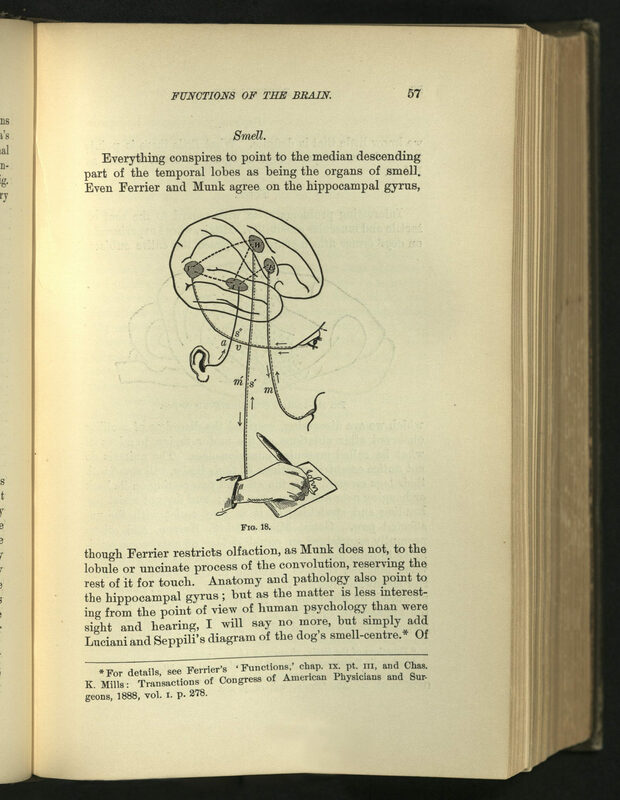 A landmark in the history of philosophy, The Principles of Psychology includes a survey of literature on the localized functions of the brain, an extensive analysis of the self, and theories of habit, emotion, and association, among other topics. 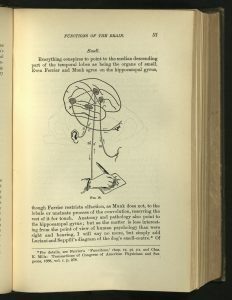 The phrase “stream of consciousness” comes from his writings. William James came from a large, wealthy New York family. He is the brother of novelist Henry James. His godfather was Ralph Waldo Emerson. While teaching at Harvard, his students included Theodore Roosevelt, George Santayana, and Gertrude Stein. His writings influenced W. E. B. Du Bois and Ludwig Wittgenstein. He associated with Bertrand Russell, John Dewey, Mark Twain, Sigmund Freud and many others. That’s a special bunch of people in the world of literature and scholarship. We also have special friends, named and unnamed. Thank you! Any one of a certain age living in Utah knows who Don Gale is. Three times a day, in the seventies, eighties, and nineties, KSL aired Don’s short, stern, fair editorials. Don was the Vice President for Public Affairs and Editorial Director at KSL. Over the years, Don has donated personal papers, videos of his editorials and other material to Special Collections. 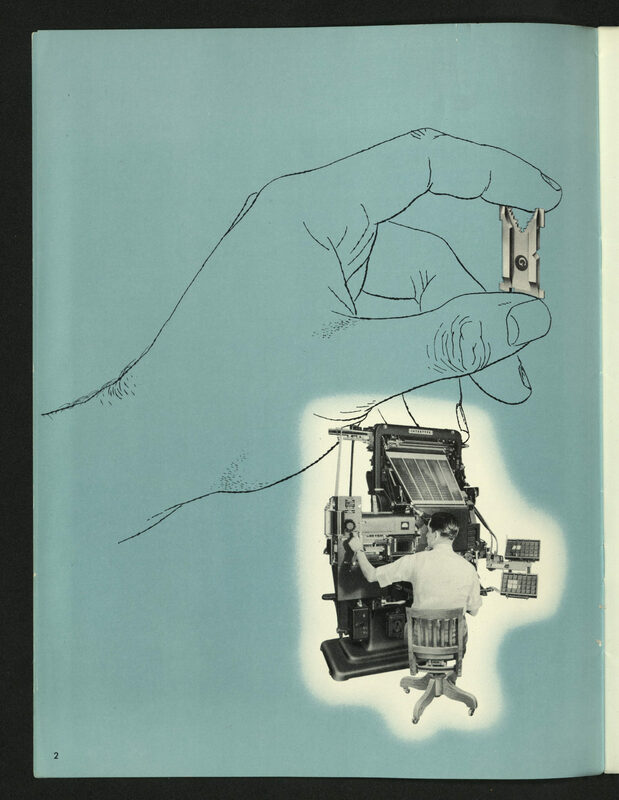 In 2006, Rare Books was the happy recipient of a collection of books and printed ephemera concerning twentieth century commercial printing technologies, including manuals and type specimen books. 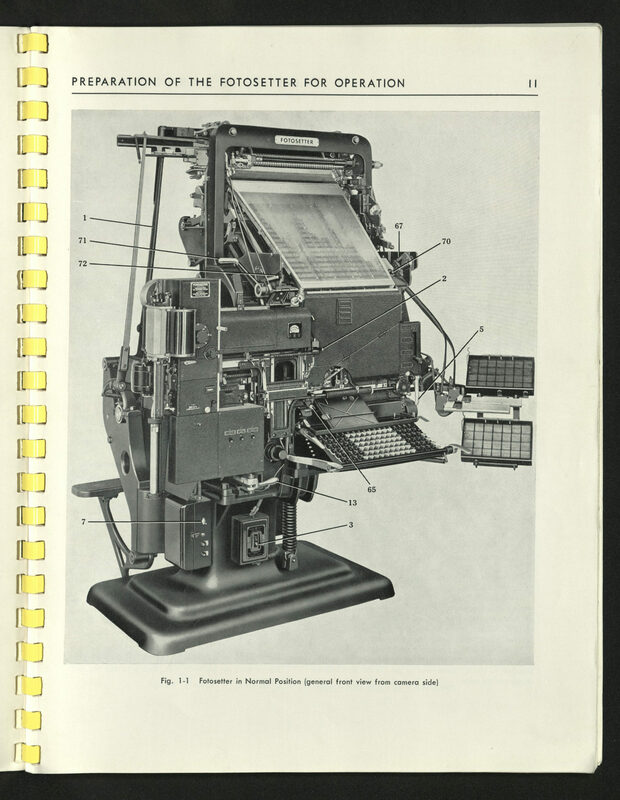 Don’s dad was a printer. Thanks to Don’s donation, we were able to provide Mr. Madsen with all the details he needed. 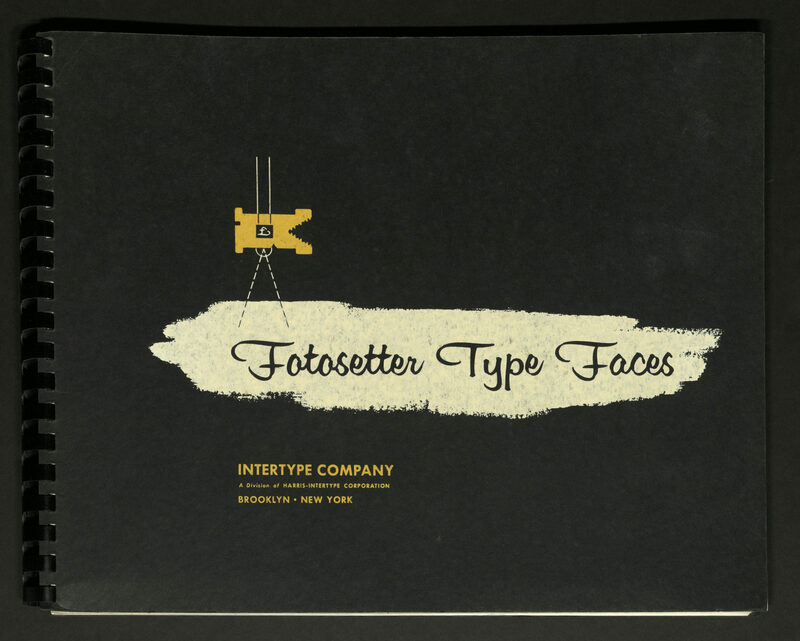 After he retired, Mr. Madsen and his wife visited museums featuring typesetting, but never ran across a Fotosetter. 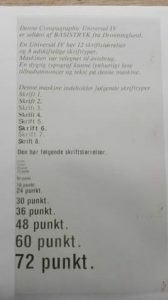 Then, in a museum in Viborg, the Vingaards Officinet, he found an Intertype Fotosetter. “I had no idea that the first Fotosetter looked like this. 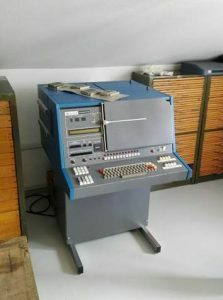 “I talked to the people at the museum and asked why they did not have a Compugraphic, the one I knew from the 1970[s]. 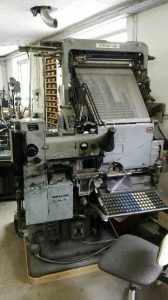 They answered, ‘If you can find one we would very much like to have one.’ Mr. Madsen thought to himself, no problem, easy job. “I started to call around, but all the machines or my old customers [had] disappeared. [Someone] gave me the idea” to contact, GRAKOM, the Danish Association for Communication, Design & Media. That contact led to an article about Mr. Mardsen in UDKOM (Outcome), an industry magazine covering issues and news for companies straddling design, media production, communication and marketing. The article eventually led to a phone call from a man who had a Compugraphic Universal V. It wasn’t working, but Mr. Mardsen found some parts, did what he could and donated it to Vingaards Officinet. The museum staff then asked Mr. Madsen to get their Intertype Fotosetter running. And that is how Don Gale’s donation made a difference in Denmark. 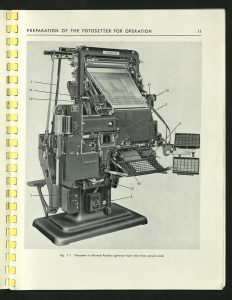 We supplied Mr. Madsen scans of a manual for operating the first Intertype Fotosetter, from Mr. Gale’s collection. And Mr. Madsen got the mid-century Fotosetter running. A generation made to last. Thank you, Don Gale and good work, Mr. Madsen! Rare Books copy is a gift from Don Gale. 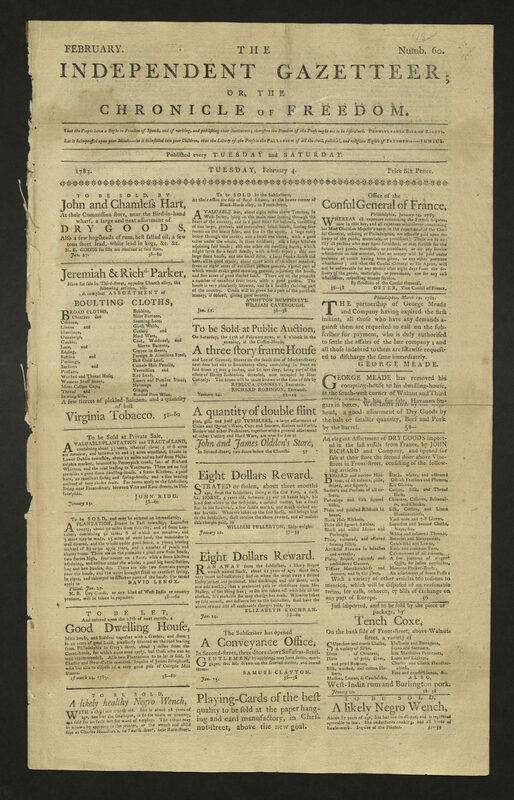 Dr. Ronald Rubin has donated four issues of early American newspapers highlighting Jewish contributions to commerce. 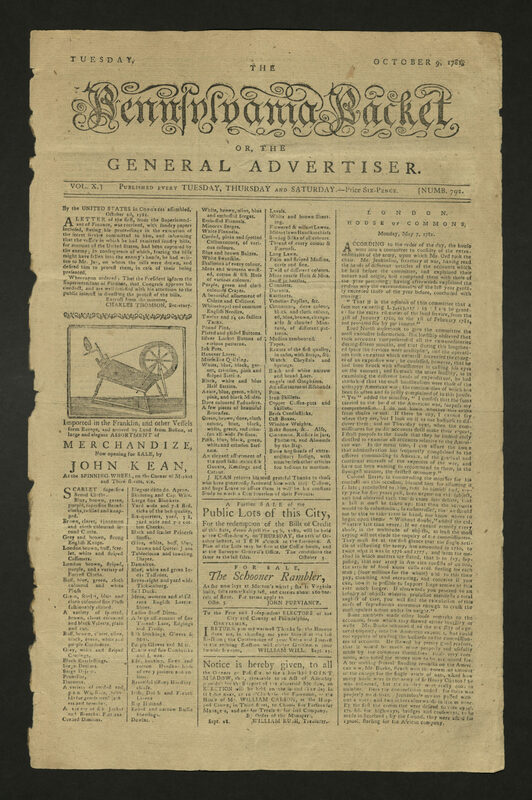 The Pennsylvania Packet, Philadelphia, October 9, 1781, features an advertisement by Haym Salomon, broker, considered the Financier of the American Revolution. 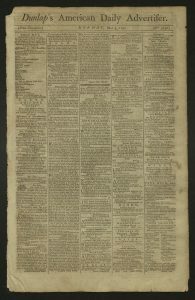 The Independent Gazetteer, or the Chronicle of Freedom, Philadelphia, February 4, 1783, contains an advertisement by Philadelphia stock brokers Isaac Franks, and Nones and Cohen. 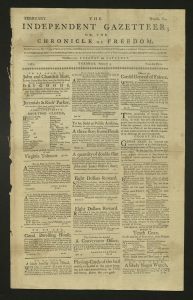 Dunlap’s American Daily Advertiser, Philadelphia, May 9, 1791, features an advertisement by Solomon Lyons, a prominent Colonial-era broker and financier. Lyons was born in 1760 in Frankfurt, Germany and died in 1812 in Philadelphia, having raised a family of six children and being an active participant with Congregation Mikveh Israel. 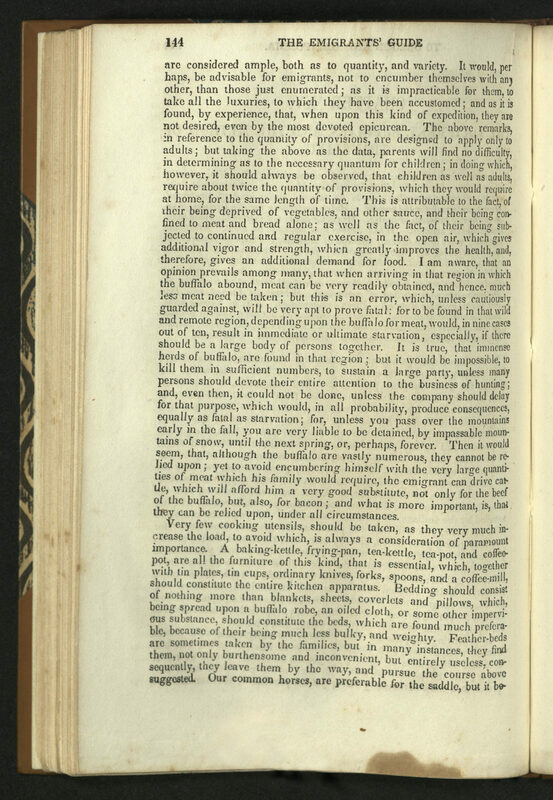 “The Bank of the United States may justly be considered as a proposition made to the monied interest, foreign and domestic — & in fact, appears to both in a very favourable point of light – the latter, from every information, are making great preparations to subscribe, and the terms are so advantages that no equal object of speculation is perhaps presented in any quarter of the globe to the former. 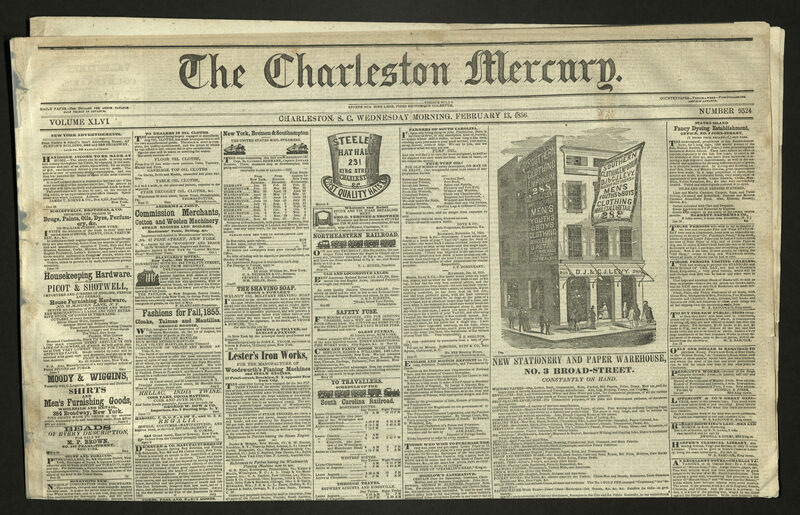 The Charleston Mercury, Charleston, South Carolina, February 13, 1856, contains a front page illustration of Levy Department Store. Thank you, Dr. Rubin, for years of your wonderful gifts! 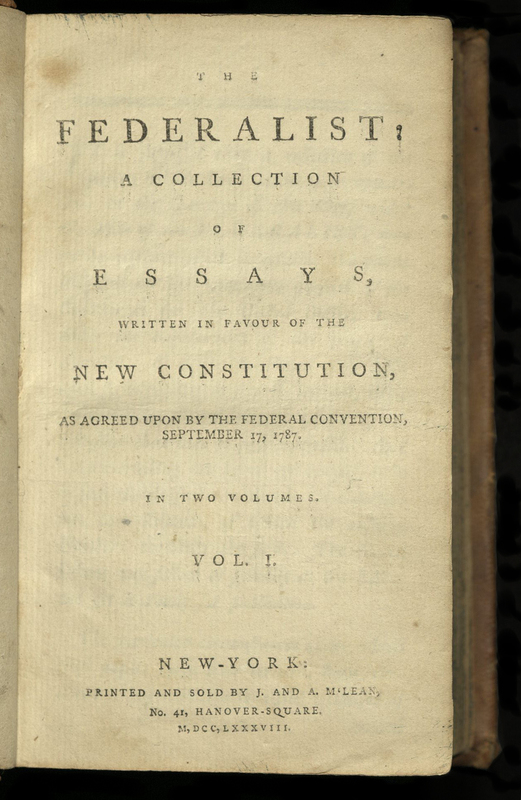 Although written for the purpose of supporting New York state’s ratification of the Constitution of the United States, these essays were eventually published together as The Federalist and were soon recognized for their brilliant commentary on the new republican charter. 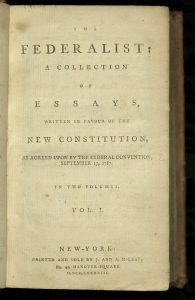 The use of The Federalist as a tool for interpreting the Constitution began before it was officially ratified and has continued to the present day. 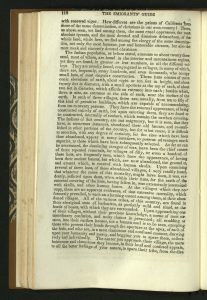 The Federalist is the fundamental document left by the framers of the Constitution as a guide to their philosophy and intentions. 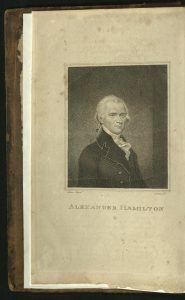 Alexander Hamilton was the principal force behind the pro-ratification pamphlets, enlisting fellow New Yorker John Jay and Virginian James Madison as coauthors of the essays. The individual responsible for each essay is not clear. 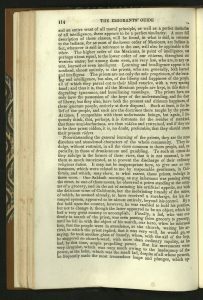 The first essay by “Publius” (the pen name for all three authors) appeared in the 27 October 1787 issue of The Independent Journal, and all or some of the subsequent numbers were also printed in the New-York Packet, The Daily Advertiser, and The New-York Journal. 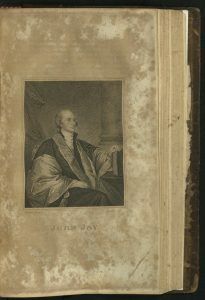 The first thirty-six Federalist essays were collected and published by the M’Lean brothers in March 1788 and the final forty-nine, along with the text of the Constitution, followed in a second volume in May. 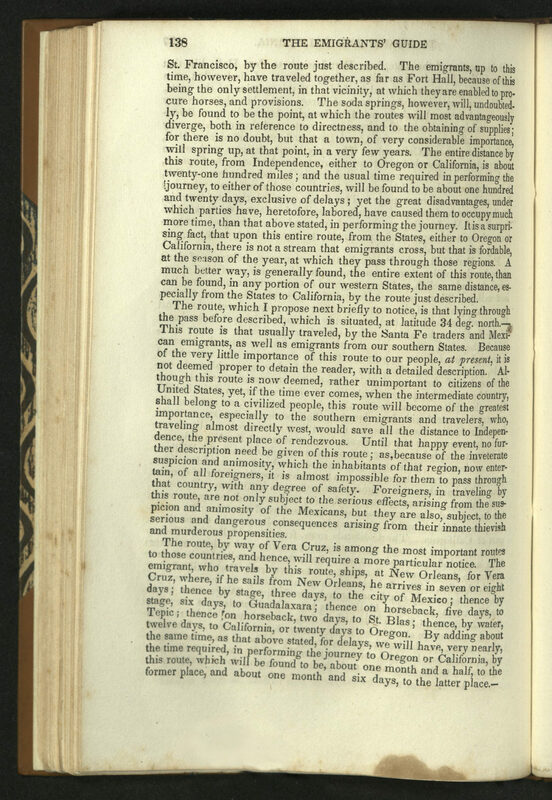 The last eight essays were printed in book form before they appeared in newspapers. In all, the essays represent one of the most important American contributions to political theory. 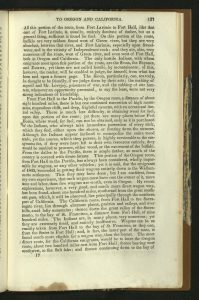 The first edition of the collection was of five hundred copies, fifty of which were purchased by Hamilton and sent to Virginia. The sale of the others was poor. 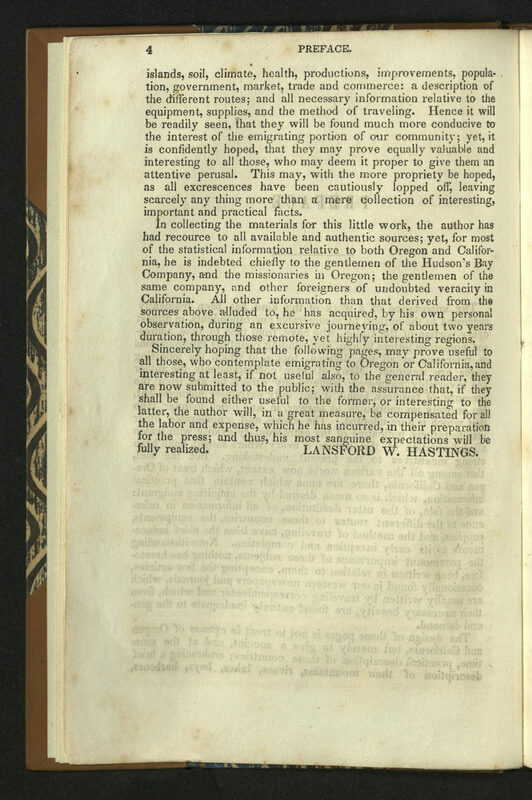 The publisher complained in October 1788, long after New York had ratified the Constitution, that they still had several hundred copies unsold. 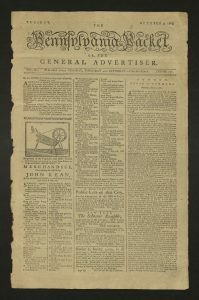 Despite the poor sales of the first edition, The Federalist was published again and nearly continuously to the present day. 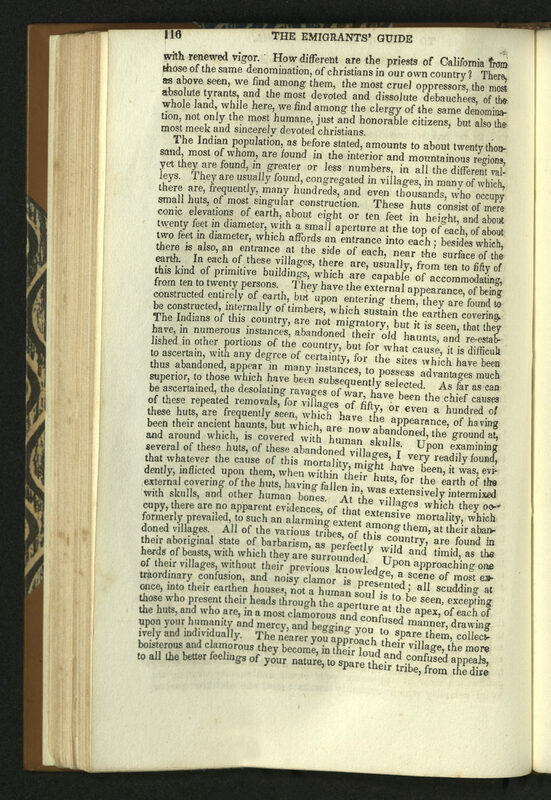 The fifth edition of The Federalist contains an appendix of the Articles of Confederation and the Constitution of the United States with Amendments, not found in the fourth edition. 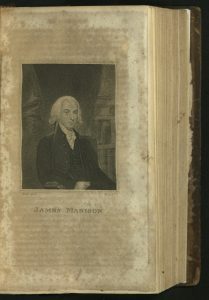 The Philadelphia imprint contains revisions by Madison, along with his claims of authorship of some of the essays previously attributed to Hamilton. 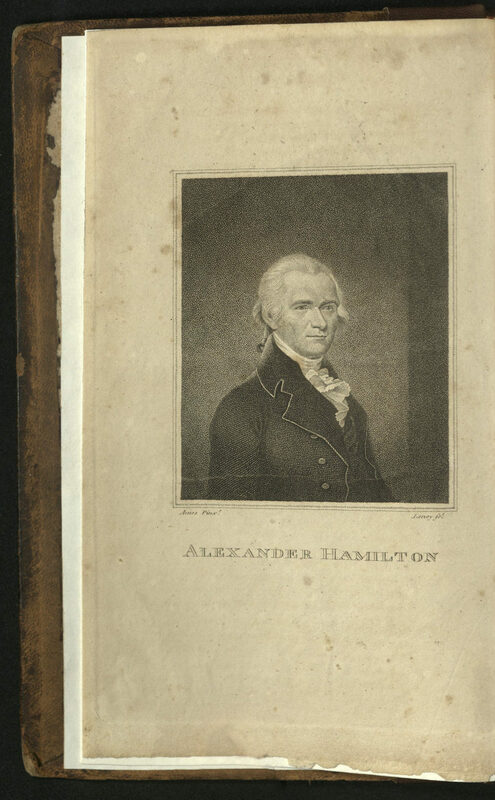 This is the second single-volume edition printed, complete with full-page engraved portraits of Hamilton, Madison and Jay. 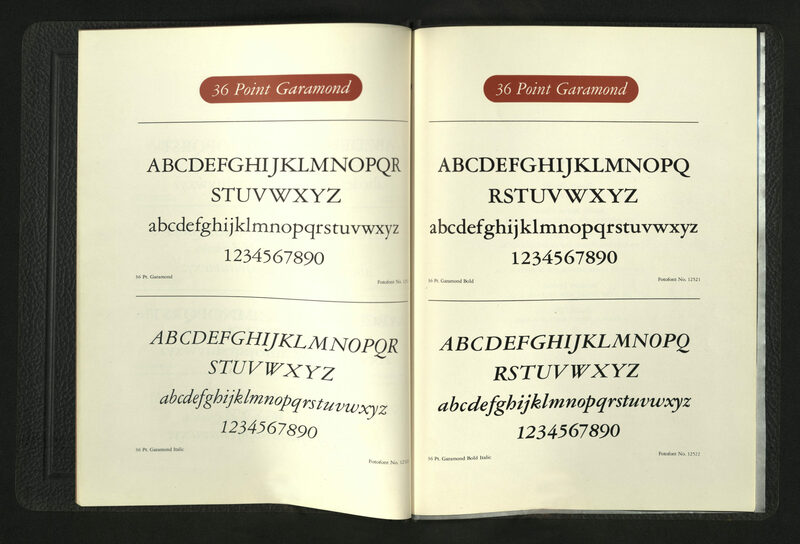 It was published the same year as a Washington, D.C. imprint. James Madison became the fourth President of the United States. Alexander Hamilton, who had represented New York at the Constitutional Convention, became the nation’s first Secretary of the Treasury, holding the post until he resigned in 1795. 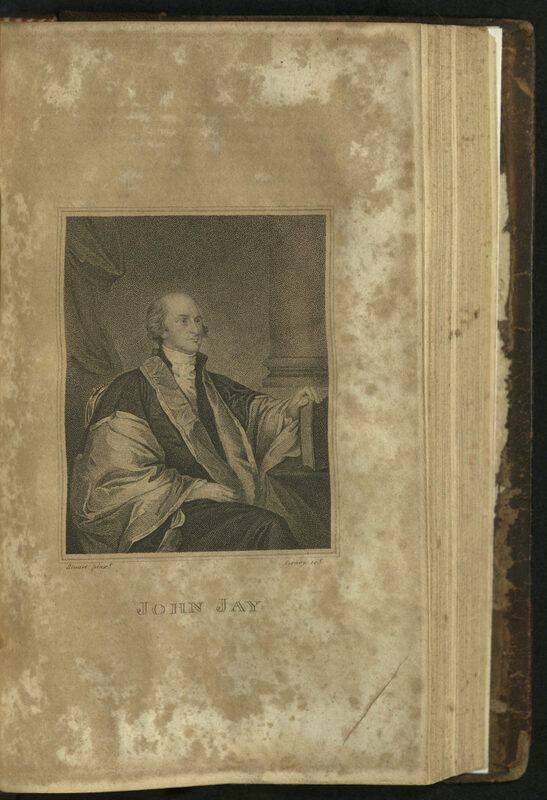 John Jay became the first Chief Justice of the United States in 1789, stepping down in 1795 to become governor of New York, a post he held for two terms, until retiring in 1801. 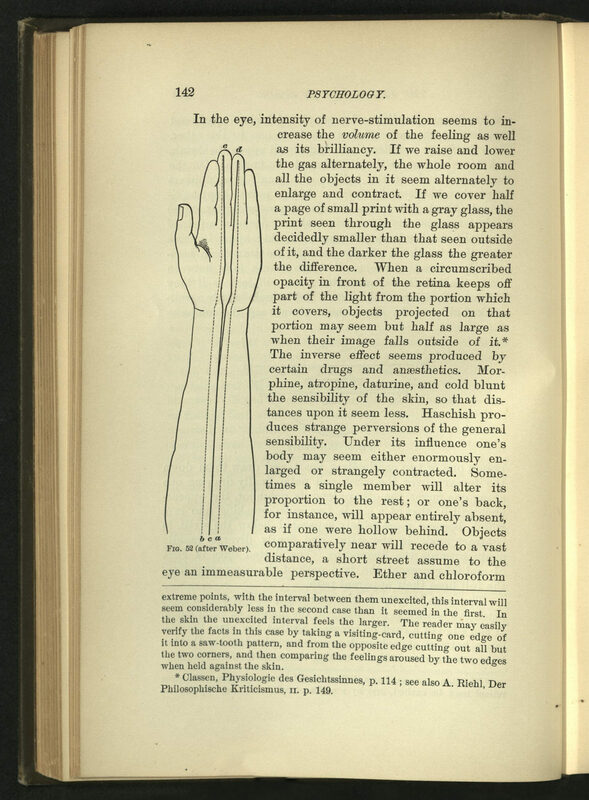 Rare Books copy of fifth edition is gift of Dr. Ronald Rubin. Gift of Dr. Henry S. White, Dean, College of Science Distinguished Professor of Chemistry. 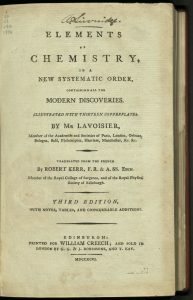 When he received his Ph.D in chemistry from the University of Texas, Henry Sheldon White’s mother gave him a copy of the fourth edition of Antoine Laurent Lavoisier’s Elements of Chemistry. The pages of this book were worn and brown with years of use, but it was intact, despite a deteriorated binding. Not a year later, while Dr. White held a postdoctoral appointment at MIT, he spent $105 to have the binding restored. 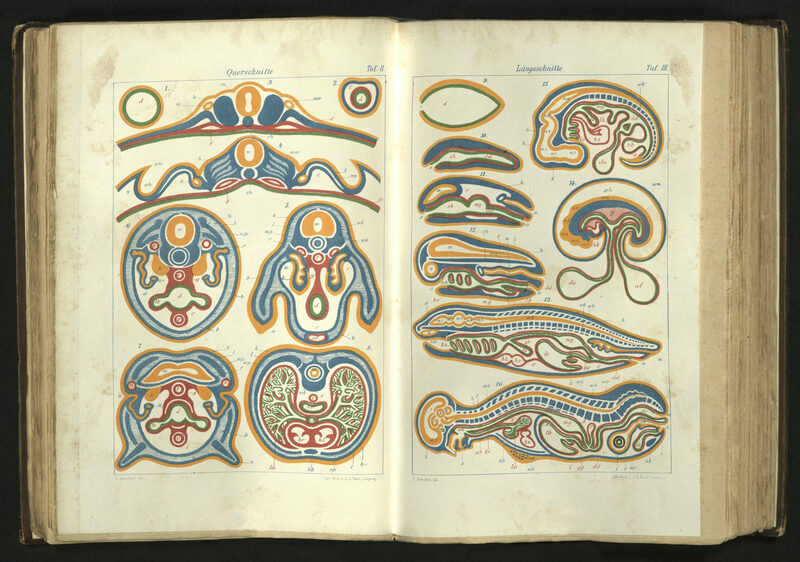 The restoration was done by professional bookbinder and conservator Nancy Carlson Schrock. 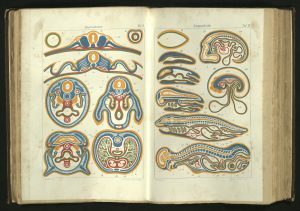 The gift and its restoration were so important to Dr. White that he kept the book and the conservator’s invoice for the next thirty-four years. And then, he gave both to the Rare Books Department. When Dr. White had occasion to hold our first edition of Lavoisier’s Traite, he fondly remembered the best graduation present ever. 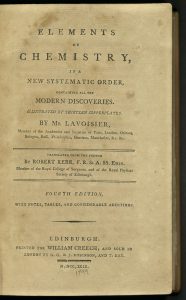 Dr. White remembered reading Lavoisier’s work like someone might remember holding the hand of one’s first love – a lasting impression, even as life moves on. 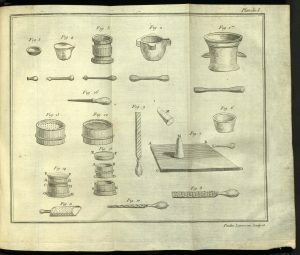 He remembered the detailed copper engraved illustrations at the back of the book, made by Lavoisier’s beloved wife, Marie-Anne Paulze Lavoisier. He lamented the loss of Lavoisier, who nearly survived, but did not, the French Revolution. Henry White joined the faculty of the Department of Chemical Engineering and Materials Science at the University of Minnesota, where he was the McKnight and Shell Professor of Chemical Engineering. In 1993, he moved to the Department of Chemistry at The University of Utah where he is a Distinguished Professor. Prof. White is the Dean of the College of Science at The University of Utah, and previously served as Chair of the Department of Chemistry (2007 – 2013). Dr. White’s current research interests include high-field transport in nanometer-wide electrochemical cells, DNA structural analyses using protein ion channel recordings, the formation and stability of nanobubbles, and transport phenomena in nanopores. All of which is and ever shall remain a mystery to me. But I do understand how the newly confirmed Dr. White must have felt when he held this book in his hands, a preserved package of ideas communicated by means of words, at the beginning of a new journey. Congratulations to The University of Utah’s 2017 graduating class. May you render the road smooth with ease and perspicuity. 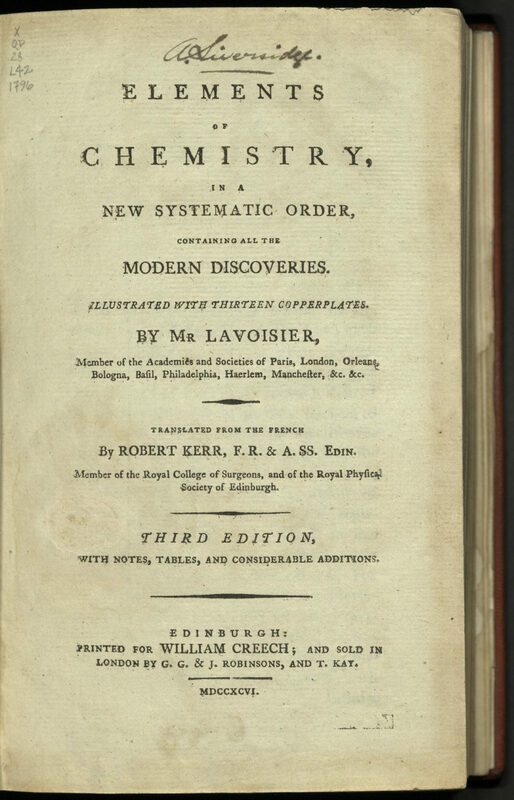 Antoine Laurent Lavoisier laid the foundation for modern chemistry by establishing the concept of elements as substances that cannot be further decomposed. 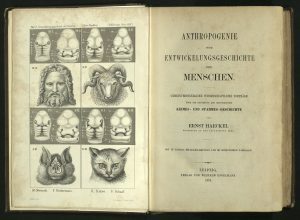 He carried out the earliest biochemical experiments and through these explained many of the cyclical processes in animal and vegetable life. 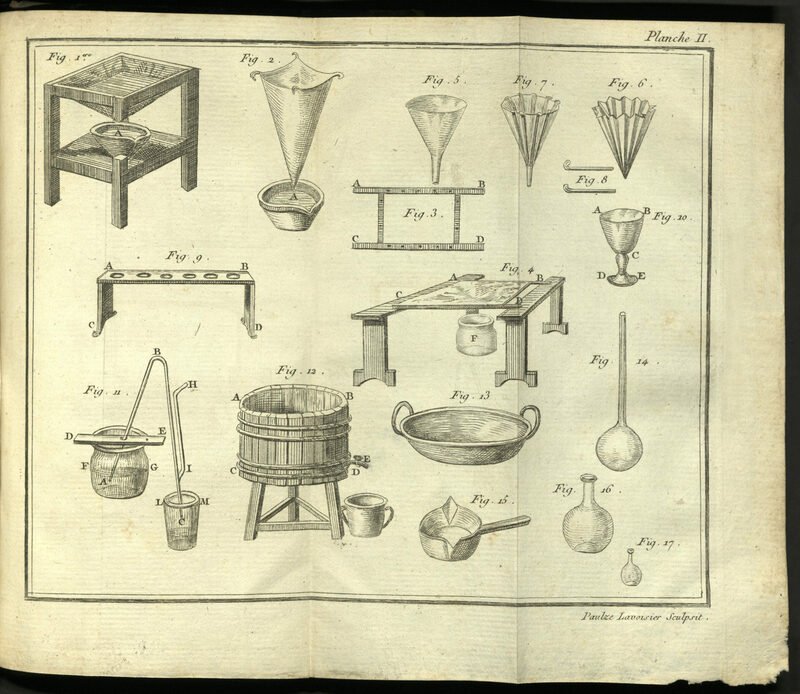 One of the most important consequences of Lavoisier’s work was the establishment of the concept of the conservation of matter. 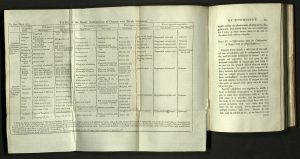 Traite elementaire is presented in the form of a manual. 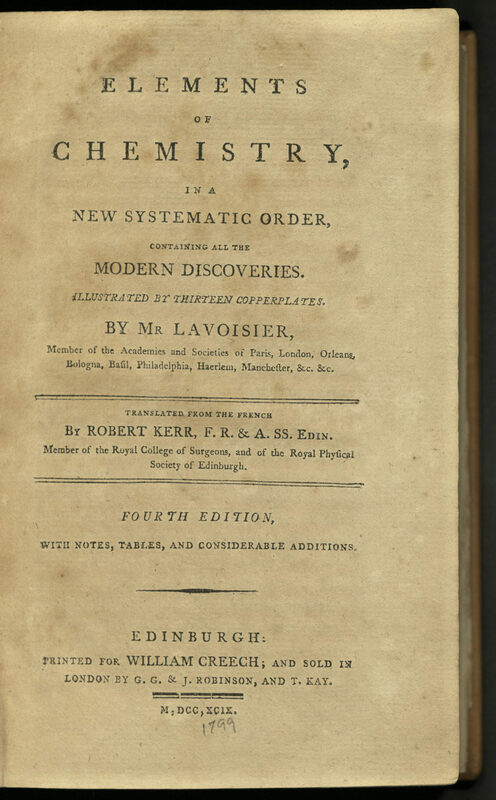 Lavoisier offered a new theory of chemistry treated in a systematic approach unlike anything that had preceded it. 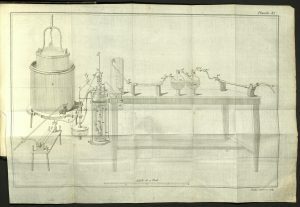 He used accurate measurements for chemical research, such as the balance for weight distribution at every chemical change. 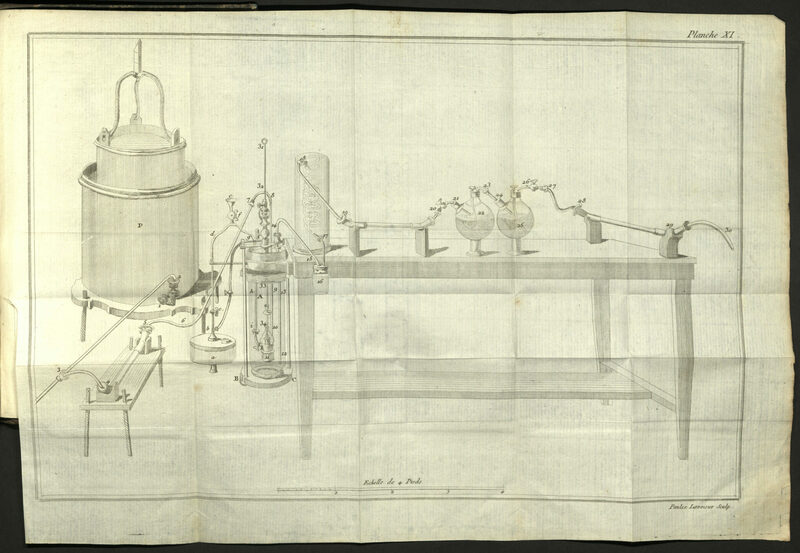 He reformed chemical nomenclature, assigning every substance a name based upon the elements of which it was composed. He proved that the increase in the weight of metals was due to something taken from the air, and that this effect was constant in all such processes. He named this substance “oxygen.” He concluded that water was a compound of oxygen and hydrogen. 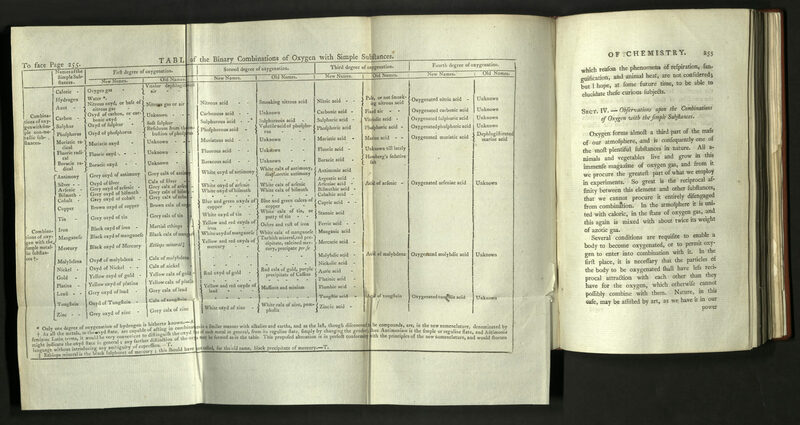 He understood that respiration and combustion were similar processes, and, since oxygen was that part of the air that combined with metals in the process of combustion, he named the resulting substances oxides. 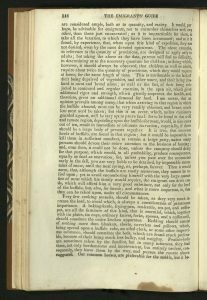 Compound bodies were found to present the combined weight of the simple bodies of which they are composed, while, when these simple bodies are withdrawn, they have the same weight as was put in them; i.e. matter remains constant throughout all chemical changes. 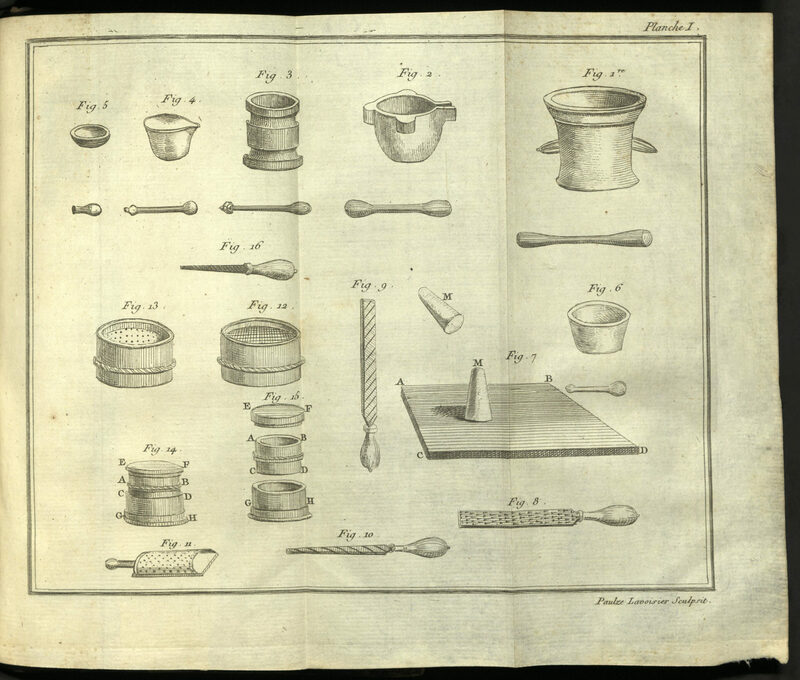 The book contains thirteen copperplate illustrations, drawn and engraved by Lavoisier’s wife, a skilled painter who had studied under the artist Louis David. With two folding tables and thirteen folding copper-plates engraved by Lizars after Mme. Lavoisier. Rare Books copy bound in contemporary tree calf, gilt ruled, red morocco label and gilt on spine. 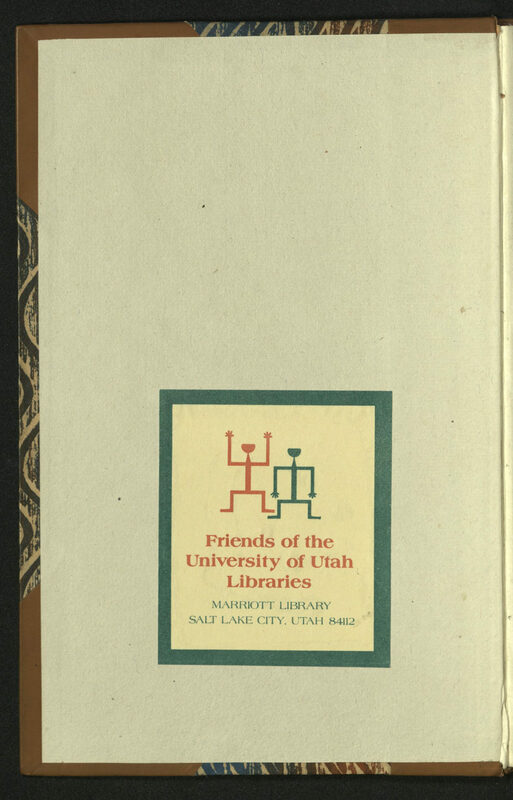 Rare Books copy from the library of Horst E. Schober (1880-1950), the chef at the Newhouse Hotel and the Salt Lake Country Club during the 1930s and 1940s. 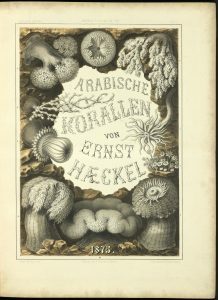 Ernst Haeckel traveled the world. 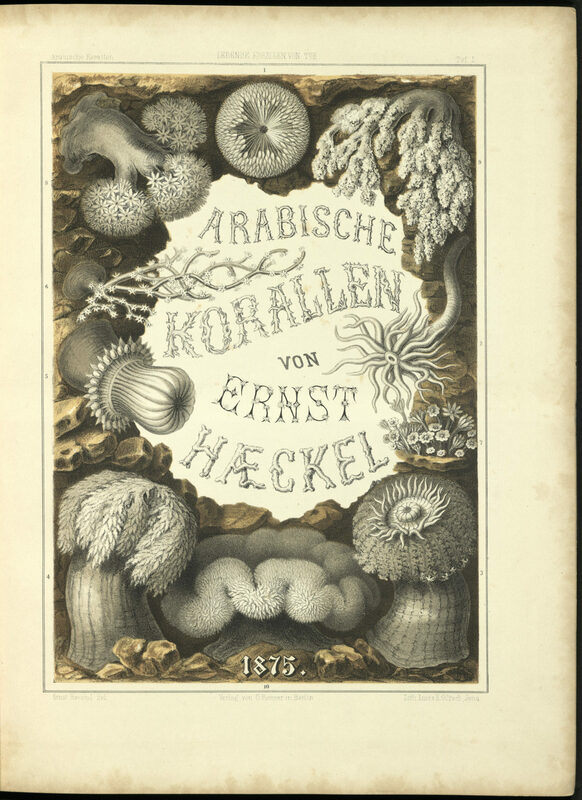 The cumination of Ernst Haeckel’s journey in 1873 to Egypt was his visit to the surreal coral banks of Tur in the Red Sea. 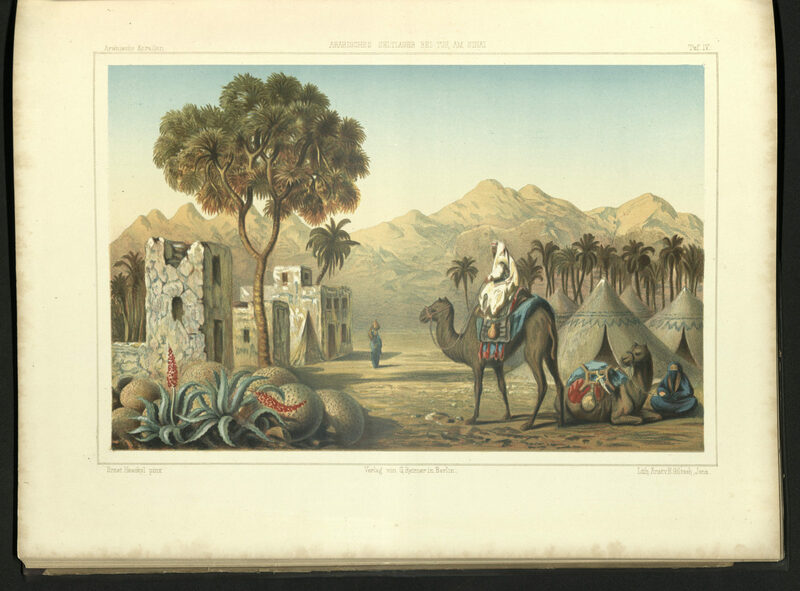 His exploration of the banks was expedited by the use of a steamer, which Ismail Pasha, Egypt’s Khedive and the dedicatee of the volume, put at his disposal. 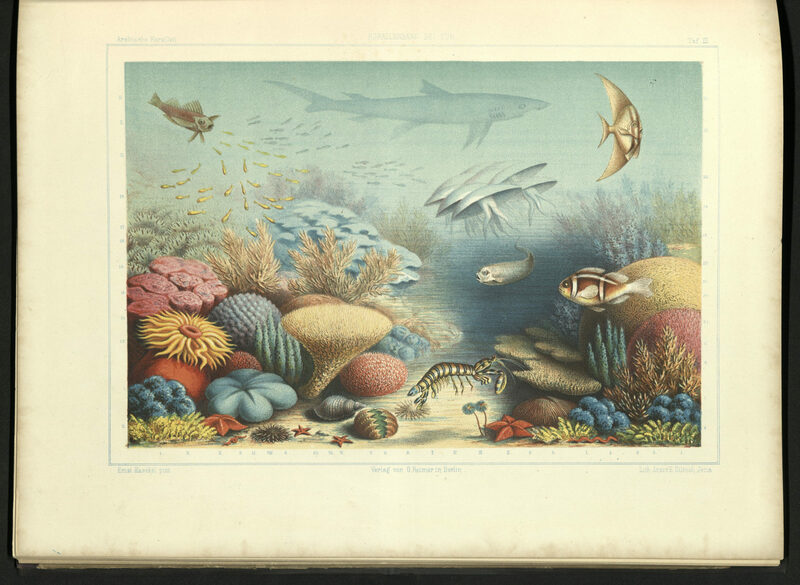 Landscape painting was a lifelong hobby of Haeckel’s. He painted numerous scenes in watercolor during his travels, some of which are reproduced here in chromolithographic plates. 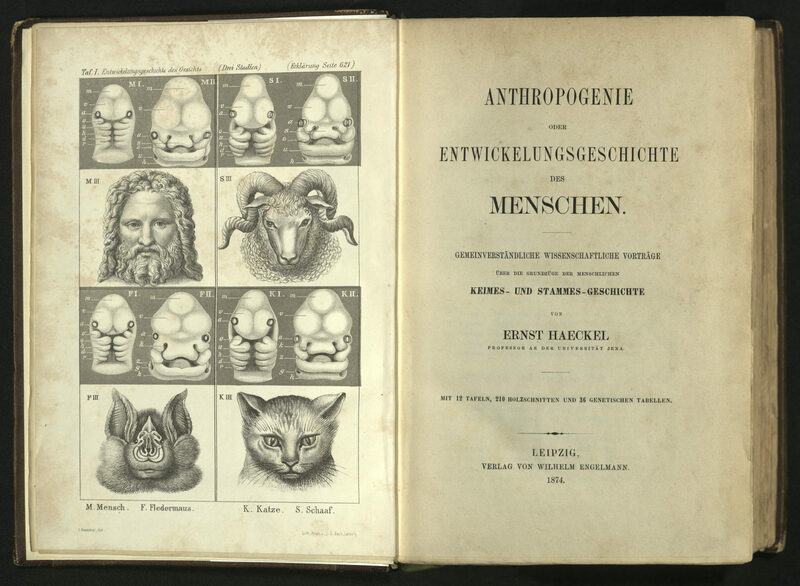 Rare Books copy from the library of Horst E. Schober.